From the Fall equinox to Winter solstice, the position of sunset on the western horizon migrates from due West towards the South, a phenomena captured in this series of images taken by Mr. Ryan Salenga. The total yearly motion of the Sun on the horizon is analogous to the swing of a pendulum. 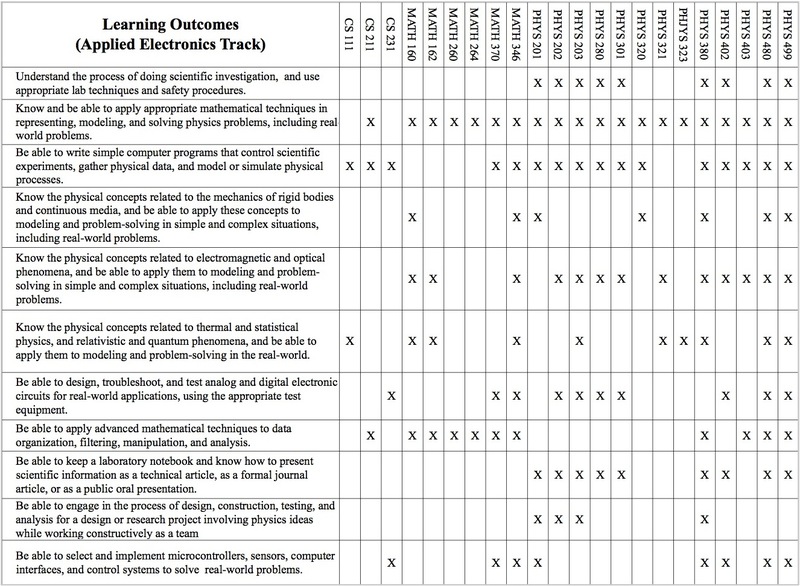 Student Learning Outcomes - Applied Physics Major. Provides a practical and historical introduction to astronomy. The course includes solar system astronomy, stellar astronomy, galaxies, and cosmology, with an emphasis on comparative planetology and the historical and cultural development of our knowledge of the solar system. May not be taken for credit by students who have received credit for PHYS 342. Satisfies upper division GE requirement BB. An overview of the principles of mechanics, thermodynamics and waves. The areas covered include: observation and measurement, kinematics, dynamics, work and energy, impulse, and momentum, fluids, heat and temperature, oscillations, and waves in mechanical media. Three hours of lecture and three hours of laboratory. Enrollment Restriction: Completion of the Lower-Division GeneralEducation requirement in Mathematics/Quantitative Reasoning (B4). Enrollment Requirement: Completion of a course in trigonometry at the high school or university level. A broad coverage of the principles of mechanics and wave motion. The areas covered include: Observation and measurement, kinematics, dynamics, work and energy, impulse and momentum, equilibrium of rigid bodies, rotational motion, oscillations, and waves in mechanical media. Required for students whose field of study is physics, chemistry, or computer science. Counts toward the fulfillment of the lower-division General Education requirement in Physical Universe and Its Life Forms. Three hours of lecture and three hours of laboratory. Recommended Preparation: High school physics. Enrollment Requirement: Completion of MATH 160 with a minimum grade of C (2.0). A broad coverage of classical electromagnetism and optics. The areas covered include: electric charge, electric fields, electric potential, capacitors and dielectrics, DC circuits, magnetic fields, magnetic properties of matter, AC circuits, Maxwell's equations, electromagnetic waves, the nature and propagation of light, geometrical optics, and wave optics. Three hours of lecture and three hours of laboratory. Enrollment Requirement: Completion of PHYS 201 or 205 and MATH 162 with a minimum grade of C in each. An overview of the fundamental ideas of modern physics and coverage of the principles of fluids and thermodynamics. The areas covered include fluids, temperature, heat, the kinetic theory of gases, entropy, and the law of thermodynamics, along with the theory of special relativity, wave particle duality, an introduction to quantum mechanics, and atomic physics, the electronic properties of solids, nuclear physics, and a descriptive introduction to the standard model and cosmology. Three hours of lecture and three hours of laboratory. Enrollment Requirement: PHYS 202 or 206. A broad coverage of the principles of mechanics, properties of matter and wave motion. The subjects covered include: Observation and measurement, kinematics, dynamics, energy, momentum, equilibrium, fluids and solids, thermodynamics, oscillations, and waves. Required for students whose field of study is biology. Three hours of lectures and three hours of laboratory. 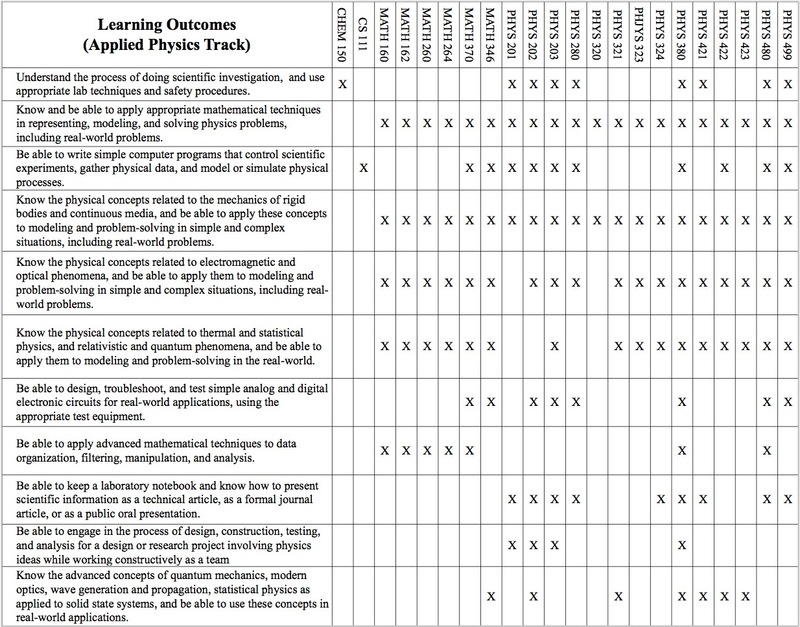 Recommended Preparation: High school physics or an introductory college level physics course. Co/Prerequisite: MATH 160. A broad coverage of electromagnetism, optics, and nuclear physics. The areas covered include: Electrostatics, electric fields, magnetism, magnetic fields, electric circuits, geometrical optics, optical instruments, nuclear physics, radiation, and spectroscopy. Required for students whose field of study is biology. Three hours of lecture and three hours of laboratory. Enrollment Requirement: Completion of PHYS 201 or PHYS 205, and MATH 160 with a minimum grade of C (2.0) in both courses. Problem solving sessions focused on interpreting physical situations and applying physics concepts to solve problems. Students will practice using graphical and mathematical representations, planning and carrying out solutions, and assessing answers. Partcipation in these sessions can improve student performance in traditionally difficult courses. Strongly recommended for all students enrolled in lower-division physics courses. Corequisite: Enrollment in the appropriate lower-division Physics course. The content of each course is reflected by its subtitle. May be repeated as course number (below) changes for a maximum of three (3) units. Introduction to the design and measurement techniques of modern electronics. Includes AC circuit theory, passive filters, semiconductor diodes, transistors, operational amplifiers, including active filters, and a general introduction to digital circuits. The activities provide students with an opportunity for hands-on experience with a wide range of electronic circuits. Two hours of lecture and two hours of activity. Recommended completion or concurrent enrollment: PHYS 203. Enrollment Requirement: PHYS 202. Introduction to digital computer hardware design including: gates, flip-flops, registers, and memory to perform logical and arithmetic operations on numeric and other data represented in binary form. The laboratory uses digital logic integrated circuitry for experiments with combinational and sequential networks, and simple digital systems. Enrollment Requirement: CS 231, PHYS 202 or 206, and MATH 270. An introduction to research in physics education and research-based physics teaching. Subjects include how people learn and understand physics concepts and the nature of science. Additional subjects will include research-based curricula, pedagogical apporaches, and challenges associated with implementing novel teaching methods. Useful for students interested in teaching and learning physical sciences. Enrollment Requirement: PHYS 203. Fundamental physics ideas including conservation of energy, Newton's Laws, and waves. Students will engage in practices of science such as performing experiments, collecting and analyzing data, developing models, and writing and evaluating explanations. Also includes development of ideas about the nature of science and learning science, including elementary students' learning of science. Course content is aligned with content, practices, and cross-cutting concepts of the National Research Council's Framework for K-12 Science Standards, and is intended to help prepare future elementary teachers to teach science. Intended for Liberal Studies majors in the Elementary option. Prerequisite: Completion of LDGE Area B1. Intended for the non-science major, the goal of this course is to introduce students to the fundamental concepts in the physical and life sciences. Popular motion pictures, television programs and commercials, and video documentaries that contain scientific themes will be used to introduce relevant concepts, and will also serve as a common background from which students can expand their scientific understanding. Also offered as CHEM 315. Students may not receive credit to both. Classical mechanics and associated mathematical and numerical techniques: Principles of Newtonian mechanics, an introduction to Hamiltonian and Lagrangian Dynamics. Applications to central force problems and small vibrations, and other selected topics in mechanics, including applications in engineering and biological systems. Prerequisites: PHYS 203. An introduction to the applications of Maxwell's equations and the propagation of EM waves in relation to matter. Topics to be covered include: dielectrics, conductors, plasmas, and waveguides, and selected topics in EM wave radiation, propagation, absorption, transmission, and diffraction. Three hours of lecture. Recommended: MATH 346. Prerequisites: PHYS 202, PHYS 203, MATH 162 all with a grade of C or better. A survey of quanta based physical theories, their experimental foundations and applications: quantum physics of atoms, molecules, nuclei and electrons; introduction to condensed matter physics. Recommended: MATH 346. Prerequisite: PHYS 203. Covers the laws of thermodynamics with applications to ideal and non-ideal systems. Includes elementary kinetic theory of gases, entropy, classical and quantum statistical mechanics. Other topics covered may include magnetism and low-temperature physics. Prerequisites: PHYS 203. An examination of the everyday objects and technologies that surround us. Familiar objects areused as a context for exploring basic physical principles. Among other topics, the course will explore how microwave ovens, cameras, hard drives, and photocopiers work. No previous coursework in science or technology is assumed; intended for science and non-science majors. Satisfies upper division GE requirement BB. An introduction to the physics of sound. Various aspects of the science of sound are covered including the nature of sound waves, their production, recording, and reproduction. The physics of musical instruments, digital synthesis of sounds, and the basics of room and auditorium acoustics arealso studied. Prerequisite: Entry Level Mathematics (ELM) Requirement. Satisfies upper division GE requirement BB. Provides a foundation in the science of sound as applied to speech and hearing with application in the field of communicative disorders. Students learn the fundamental science of the production and perception of sound. The physical and physiological aspects of speech and its measurement are reviewed. Normal physical processes and principles serve as a framework for understanding abnormal functioning. Clinical applications are used to demonstrate the importance of the science of sound to the clinician. May not be taken for credit by students who have received credit for PHYS 356 and 490-3-EX. Also offered as SLP 357. Students may not receive credit for both. Experimental work including an introduction to the equipment and techniques used in mechanics, electromagnetism, optics, electronics, quantum physics, nuclear physics, biophysics, medical physics, and/or geophysics. An emphasis will be placed on experimental design and data analysis. Six hours of laboratory. Prerequisite: PHYS 203. Selected topics in physics. Focuses on one or more current issues in the physics literature. A course description will be available before registration the semester offiered. May be repeated for credit as topics change. Students should check with the Class Schedule for listing of actual topics. Introduction to the design and use of sensors of various types with digital computer interfaces for data capture and experimental control. Various types of digital communication are studied including synchronous and asynchronous interfaces. The laboratory provides hands on experience in computer interfacing through integrated circuits, sensors, and microcontrollers. May not be taken for credit by students who have received credit for PHYS 302. Three hours of lecture and three hours of laboratory. Prerequisites: PHYS 301. Introduction to signals and digital signal processing including: fundamentals of signals, signal processing, filter synthesis, discrete-time systems, discrete Fourier transforms and FFT, Z-transforms, sampling, quantization, and image processing. May not be taken for credit by students who have received credit for PHYS 303. Prerequisites: PHYS 203 with a minimum grade of C (2.0). Includes radiation and propagation of electromagnetic waves, ray optics, physical optics, optical devices, laser optics, holography, and optics of vision. Prerequisites: PHYS 321, MATH 162, MATH 346. Selected topics in solid-state physics. Includes crystal structure, thermal, electrical, and magnetic properties of solids, elementary band theory, semiconductors, and solid-state devices. May not be taken for credit by students who have received credit for PHYS 322. Prerequisites: PHYS 203, and an upper-division non-GE mathematics course. A study of the concepts and theories of nonrelativistic quantum mechanics. Includes the Schroedinger equation, operators, angular momentum, the hydrogen atom, and applications to simple quantum mechanical systems. Prerequisites: PHYS 323, MATH 346. A modern view of biological systems from the analytical and quantitaive perspective of physics. Examines how seemingly complex biological systems are similar and different from the physical systems that physicists generally analyze. Applies simple physical models to understand several biological systems at a quantitative level. Intended for physics, biology and chemistry students. Prerequisites: PHYS 202 or PHYS 206. Advanced treatment of physical and geometrical optics. Subjects may include: lenses and aberrations, polarization, fiber optics, interferometry, spectroscopy, phototonics, lasers, and optical sensors. Prerequisite: PHYS 321; recommended MATH 346. May not be taken for credit by sutdents who received credit for PHYS 490-5. Experimental work including in-depth experimentation in mechanics, electromagnetism, optics, electronics, quantum physics, computational physics, biophysics, medical physics, and/or geophysics. An emphasis will be placed on experimental design and data analysis. Six hours of laboratory. Prerequisite: PHYS 203, PHYS 280. Selected advanced topics in physics. Focuses on one or more current issues in the physics literature. A course description will be available before registration in the semester offered. May be repeated for credit as topics changes. Students should check the Class Schedule for listing of actual topics. Library or theoretical physics research project. The student must consult with a physics faculty member to decide on the topic and then produce a 10-20 page paper. The paper must summarize the current state of knowledge on the subject and include an appropriate bibliography. May be repeated for a total of six (6) units. Enrollment restricted to students who have obtained consent of instructor. Experimental or computational physics research project. The student must consult with a physics faculty member to decide on the research problem and then work collaboratively under the guidance of the faculty member. The student will produce a 10-20 page paper summarizing the research and the results obtained. An appropriate bibliography must be included. May be repeated for a total of six (6) units. Enrollment restricted to students who have obtained consent of instructor. The Independent Study/Research & Internship Contract form must be filled out by both student and instructor. For those students choosing to use internship experience for their 499, please consult with Professor Tsui.